Stories that sell – Canadian own goal? At the end of a vacation in Western Canada I was walking through the main terminal of Vancouver Airport. Relieved to have returned my rental vehicle unscathed, searching for my departure desk, and sorry to be leaving a country with so much to admire and enjoy, I was suddenly stopped in my tracks by a huge bronze statue. Sleek and monumental, set in a small amphitheatre, ringed on one side by curved wooden benches, it provided a stunning focal point for the terminal’s main entrance. Looking more closely I saw it depicted a group of thirteen strange looking travellers, crowded into a canoe. Undeniably dramatic and strangely compelling, I nonetheless found it very disturbing. The figures were grotesque and savage, the vessel was burdened with primitive symbolism, and the motley crew looked grimly mutinous, even eerily cannibal. I was getting a very strong message – it made no sense, and yet it filled me with disquiet. My concerns, however, were not shared by those around me. At about 20 feet long and 13 feet high, the sheer size of the thing made it hard to miss. What’s more, it was totally at odds with the bright colours of the surrounding fast food concessions, souvenir stores and check-in desks. Like some alien spacecraft from another planet, it was so discordant that it was almost impossible to ignore. And yet everyone seemed totally oblivious to its massive, brooding presence. The nearby benches were crowded with sleeping backpackers, families sharing their last minutes before their final goodbyes and travellers whose minds were already someplace else. Beyond this indifferent circle of non-lookers countless others passed by, talking into mobiles, wheeling cases, killing time…but never giving the mighty object, and its mysterious message, more than a nano- second’s attention. This indifference bothered me almost as much as the object itself. I stepped closer, circled it, then photographed it. A small plaque, mounted nearby, informed me that this work of art was entitled “The Spirit of Haida Gwaii, The Jade Canoe”. 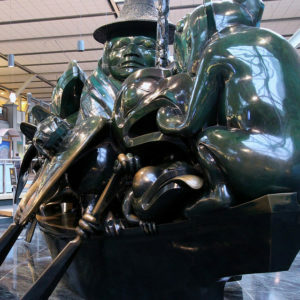 Originally created by local artist Bill Reid for the new Canadian Embassy in Washington DC in 1991, a second casting was commissioned by the airport in 1993. It was therefore intended, presumably, to stand for Canada itself, a symbolic statement designed to tell onlookers something about the country, peoples and society. The plaque informed me that “Haida Gwaii” means “Islands of the Haida People”. The words of the artist, Bill Reid, offered the following explanation. “You are standing before a representation of an ancient Haida dugout canoe, in this case bearing thirteen supernatural creatures, each related in some way to the Haida’s mythical past.” He then lists each one in turn, from the Bear and his family on the prow, to the Raven at the helm. It is not a happy company – as the artist points out, the Wolf has his sharp teeth embedded in the Eagle’s wing, while that fearsome bird retaliates by tearing the Bear’s paws in its beak. We also learn that the steersman, the wily Raven, is not to be trusted – instructed by his grandmother, Mouse Woman, he sets course by his “own twisted imagination” and “guides the boat on an ever erratic course”. What are we meant to take from this story? What message did the artist, and those who commissioned it, intend it to say? If it is a parable for the country as a whole, what does it tell us? What were the authorities thinking when they put it here, smack in the face of the millions who use the airport every year? Perhaps it is intended to suggest that Canada is a safe haven for weary travellers fleeing poverty, persecution and war in the more troubled parts of the old world? For the past 200 years the young nation has indeed performed this welcome service, and it’s an image which many Canadians would surely embrace with gratitude and pride. The Official Visitor’s guide to Vancouver underlines this by pointing out “The influx of immigrants has been continual and steady over the years, and the spirit of inclusion extends to all corners of life.” That, presumably, was the official message that the piece was intended to convey. The words of Bill Read, reproduced on the plaque, seem to go along with this as he explains that “For many centuries the Haida people lived in a rich, fulfilled existence, nourished by the wealth of their homeland and watched over by the gods and demigods who peopled their world. Then, not so long ago, disaster befell Haida Gwaii. Few humans survived and even the supernatural beings were driven from their rock bound houses to the shelter of the surrounding forests and oceans, on the turbulent surface of which rides this magic canoe.” Viewed from this perspective, it’s a metaphor for all of us travelling, in uncomfortable companionship, on this small planet. It powerfully expresses the idea that all the world’s creatures are interdependent, and can be read as an enlightened plea for tolerance and cooperation. It’s a noble message that all Canadians can be proud of, a mission statement they can all rally behind. And, by celebrating the ancient traditions of the Haida culture, it gives citizens a nice warm feeling that the country, though still young, has a deep rooted heritage. Over the next hour, passing in line through the various procedures required of what the airline industry refers to as SLC (Self Loading Cargo), I found the statue preying on my mind. Why choose traditional Haida mythology, culture and art forms, for years suppressed by the authorities, to express the spirit of the modern Canadian nation? Surely that was somewhat inappropriate and rather hypocritical? First you take their land, then destroy their way of life, before going back for the only thing they have left – their heritage. Why would someone do that? On the nine hour flight I tried to put these thoughts out of my mind. I watched Cameron Diaz and Ashton Kutchner in “What happens in Vegas”. Twice. Then “Sleepless in Seattle”. But the question continued to gnaw at me, and I too was sleepless. The answer, I began to realise, probably had something to do with Maslow and his theory that much of human behaviour can be explained in terms of a hierarchy of needs. He suggested that human beings have a progressive series of requirements which they seek to fulfil. These start with the physical need for food, shelter, and security. Once these basic survival needs have been satisfied people raise their sights and concern themselves with more elevated social needs, the need to create a sense of belonging, to integrate within a group or community. I guessed it was possible to view the development of any country or nation, including Canada, in these terms. In the early days of the nineteenth century the first settlers, and the fledgling nation itself, was concerned with survival. The environment had to be tamed, the economy had to be established, and territory had to be secured. Part of this process involved, as a matter of practical expediency, the removal of the indigenous people from the land and the suppression of their former way of life – a form of acceptable collateral damage. Gradually, as people and society became more established, concerns about identity began to surface. The settlers had consciously shed their previous identities by breaking away from their traditional communities, cultures and homes to make a fresh start on the far side of the world. Obviously each group, whether from the Hong Kong, Edinburgh, or the Punjab, brought a legacy with them, but there was little in the way of a common culture or identity that they could all subscribe to and adopt. On a personal level this would have been merely disquieting, but on a collective one it would prove economically disadvantageous – nations, especially young ones, are in the business of attracting investment, encouraging immigration and selling their products abroad. To do that requires marketing, and effective marketing, whether you are a corporation or a country, selling Canadian holidays, bidding to host the Winter Olympics, or trying to attract more skilled workers, calls for a strong brand identity and a compelling story. This not only gives citizens a nice warm feeling – it’s a commercial imperative. So, on a personal level, many Canadians are probably searching, either consciously or unconsciously, for a shared heritage and a common identity. But, given the diversity of the citizens and their roots, only one is available – that provided, somewhat unwillingly, by the First Nations. But does it resonate with today’s citizens? Not really – which is why, I suspect, so many show such indifference to Bill Reid’s work of art. But, in the absence of anything more appropriate or compelling, what other choice do they have? On the national level, as a piece of marketing collateral, the image and accompanying story, probably functions quite effectively – the themes of interdependence and inclusivity tick many of the right boxes. The powers that be, searching for a suitable icon, must have taken a calculated decision. Appropriating the heritage, after you’ve taken everything else from the first nations, could be construed as adding insult to injury – but what the heck? The end justifies the means, and if anyone objects we can say that theft was the last thing on our mind – we’re paying homage, not taking liberties. From my observations politicians seldom have trouble treading fine lines like this when there’s enough money at stake. But maybe those in Canada are different? This is largely guesswork on my part. I have no idea what Canadians feel with regard to this statue, nor do I know what really went through the minds of those that commissioned the piece. But my conjectures do square with what I have learnt in a 30 year career as a marketing consultant. Was I now able to let the subject drop? No. The more I thought about it, the less able I was to accept this sunny, politically correct, “let’s all work together and live happily ever after” interpretation. The work of art was too dark for me to buy on that level. Plus, as I researched the background to the artist himself, and read more about the piece in question, I realised it was far too complex for such a simplistic one dimensional interpretation. What I saw, when I stripped away the context, and concentrated on the piece itself, was conflict, distrust, betrayal, savagery, uncertainty, evil, hatred. Perhaps the artist had a subversive intent? Could it be he was suggesting that the disaster which befell the Haida people, which ended their “fulfilled existence, nourished by the wealth of their homeland”, a disaster that happened “not so long ago”, was the arrival of the white man? Maybe he is simply articulating all those feelings which the First Nations dare not utter in words? Perhaps, instead of providing a metaphor for the world in general, he is making a direct statement for Canadians in particular? Is he not pointing an accusing finger straight at the heart of the culture which has supplanted their own? It is not a promise, but a curse, a grim warning to the interlopers who have made the First Nations the last citizens? Is it not, in fact, saying “you have robbed us, but you will never enjoy your ill gotten gains – you are condemned to travel endlessly in discord and strife without purpose, direction or fulfillment.”? Viewed from this perspective it stands as an incredibly perceptive indictment. In just a couple of hundred years the corridor of land on either side of Highway 1 has been raped of minerals, oil, gas and timber. The seas have been plundered and countless runs of silver salmon entirely obliterated. Many of the indigenous creatures, the bear, the wolf, the eagle and the buffalo, once so abundant, are now on the verge of extinction. And what has been created in their place? Mile upon mile of shopping malls, with a pestilent plague of plastic, glass and concrete, has spread throughout the land. A rash of stores, fast food chains and motels scream their sales messages at each other across highways bearing endless streams of shiny new pick-ups, trucks and RVs. While the original peoples, dispossessed and bewildered, languish on their miserable reservations, the happy hunting grounds have been taken over by new tribes – Wendy’s, Best Western, Dairy Queen, Re/max, Home Hardware. One could argue that never in the field of human existence has so much damage been done, by so few, in such a short space of time, all in the name of progress. And why? Because people continue to pursue their own selfish interests, and bicker amongst themselves, without taking due regard for where this behaviour is leading. Bill Reid’s sculpture, for me, describes this disaster with unerring accuracy and poignancy. It is, to my mind, vengefully “off message”, an instance of the first nations having the last word. If that’s the case, how come so many people, from the authorities who commissioned it, to those who walk past every day, just don’t get it? Then again, I’m just a guy who was passing through, so what do I know? Perhaps I’m seeing things that simply aren’t there, interpretations that are way beyond what the artist intended. The simplest answer would be to ask him. Sadly, however, Bill Reid died in 1998. But his life and writings provide a number of intriguing clues. Here’s a couple of particularly tantalising ones. His mother was a Haida Indian, but she hid this fact about his true origins from him until he was twelve years old. He therefore knew, from personal experience, what it is like to have one’s heritage suppressed. Is this sculpture Bill Reid’s way of saying “Enough!”, his way of ensuring that the culture and art of his ancestors survives, his way of building on the rubble, his way of getting the whole thing going after the catastrophe, and his way of setting the record straight for his people? If so, placing the image in one of the country’s most prominent embassies, making it the focus of attention at one of its busiest international gateways, and printing it on every $20 bill, would seem to be a spectacular PR own goal. Or, just maybe, the authorities were fully aware of the story’s ambivalence, of the fact that it could be interpreted in this particular way, and adopted it in conscious recognition of the fact that it alludes to a home grown disaster of purely human origin, intending their actions as some kind of acknowledgement, atonement and apology for a dark and unedifying phase in the nation’s recent past? I give up. What do you think? Well Jim.....Whenever I read one of your blog posts I realise your not just a marketer, not just a copywriter, but you're an author. As for Canada's own goal I'm sure Bill would have enjoyed your interpretation and more than likely agreed with your message. Do the officials or politicians realise or have a tiny idea of what they could possibly be championing? Perhaps, if there's a bright politician of course! I must add though that your writings have made me think about all of us throughout the planet that appear to be r(e)aping our blue planet for everything its got. I'm thinking lots about population or over population I should say. Why is it that even China had a population policy (yes badly policed, but at least they thought) yet most countries in the west cant face up to the fact that we need to slow down our breeding - no thats not a technique in the Kama Sutra. In fact I believe Australia has a population policy yet they are one of the most underpopulated countries in the world. As many countries numbers spin out of control will we all need or have a sculptor like Bill? Are we in this very moment repeating your interpretation of the Canadian sculpture with our economy, habitat, effect on mother nature and our natural resources? Jim you have made me think.....a lot! Glad you enjoyed it and found it thought provoking - the statue itself is amazing, partly because it is so massive. Politicians will do anything to get elected and the people who vote for them will do anything to avoid an unpalatable truth (IMHO). There was a time (when the planet was not so crowded and when technology was less advanced) when this didn't matter quite so much - there was some wiggle-room left, some space in which to screw things up without it proving totally catastrophic - but I think that time is past. Unfortunately the mass of people will only notice when something truly horrendous happens on a massive scale. Hollywood keeps making movies about these scenarios (but they always set them on Manhattan Island or LA - like there is no planet beyond these two cities) and people just view them as entertainment. How to end this comment on a positive note? Art is wonderful, but you have to make time to think about it and enjoy it. Also, Rosie Rowley is lovely!